Master of Orthopaedic Surgery (MCh Orth) candidates today (1 December 2017) attended and participated in two practical Dry-bone workshops; one on the Coonrad-Morrey Elbow System and the other on the JRI Shoulder System. 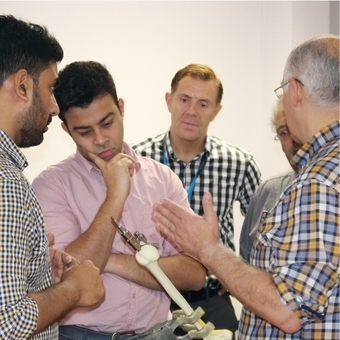 These workshops are delivered and run annually by Mr Carlos Wigderowitz, Consultant Upper Limb Orthopaedic Surgeon, with this year’s being held at the Clinical Skills Centre in conjunction with Zimmer Biomet. Mr Wigderowitz was expertly supported John Daly from JRI Orthopaedics. These workshops once again highlight the diverse range of learning opportunities available to candidates studying the MCh (Orth) Dundee course at the University of Dundee, at the No 1 Medical School in Scotland. This workshop perfectly complements the unique workshop delivered in November 2017 using Thiel cadavers. Such workshops expertly run in conjunction with lectures, research and presentation skills and clinical attachment only go to emphasise that studying the MCh (Orth) in Dundee is a unique opportunity for orthopaedic surgeons from around the world. “I would like to thank Mr Wigderowitz for his continued support of the MCh (Orth) Dundee degree. Candidates benefit immensely from his hands-on experience and enthusiasm for upper limb surgery”, said Professor Rami Abboud. “We are indebted to JRI Orthopaedics for their yearly collaboration and generosity in donating their cutting-edge equipment and expertise for these highly instructive sessions”.